One of the bigger features of Redemption was the animals you could interact with. Whether you shot at birds while traveling between towns or gripped your gun with fear after hearing a cougar growl in the distance, animals are a beloved feature of the game. There are 178 animals in Red Dead Redemption 2. Many are variations of the same species. Legendary animals return from Redemption. You'll need to hunt them down but be warned: they put up one hell of a fight! Animals are much more interactive among themselves. The first trailer showed a fox hunting a squirrel and vultures tearing into a coyote carcass. The second trailer showed a wild boar attacked by an alligator. 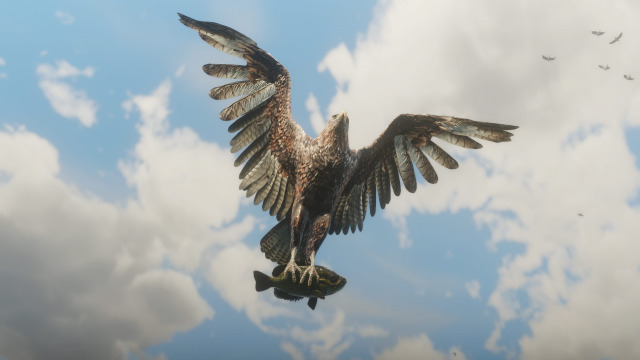 Screenshots show a few creatures with freshly caught meals. Rockstar Games has certainly raised the bar with the creatures in Red Dead Redemption 2 and we can be sure there are plenty of other new species yet to be shown.